Agricultural entrepreneurs play an integral role in creating an economically and environmentally sustainable way to end global hunger. Learn how SGBs are taking action to do this. Key to achieving Sustainable Development Goal #2 (Zero Hunger) is making healthy food affordable and accessible to everyone. With her company, Agruppa, Agora Partnerships’ alumni Carolina Medina intends to do just that. Through use of a mobile app, Agruppa creates collective buying power among “mom and pop shop” owners, allowing small vendors to purchase fruits and vegetables at lower rates which, in turn, enables them to reduce prices for consumers. “Hunger in our country does not necessarily mean lack of access to food, but lack of access to affordable and nutritious food,” says Carolina. With 75% of food sold in Colombia through small vendors, Agruppa has huge potential to scale and make tangible progress towards achieving the Zero Hunger global goal. Agrics is a social enterprise that helps farmers gain access to credit to be able to get the inputs they need at the beginning of a growing season. See how this is helping create food security and increasing household incomes in Kenya and Tanzania. Agrics was founded by ICS, a Dutch-based NGO that focuses on sustainable rural development in developing countries. At the core of the ICS approach is economic development, using the forces of the market economy to create sustainable solutions to social problems. Victor Kipkorir took a gamble to leave a career in electronics engineering in Dubai to start a farm. He and his wife, Nicollete back to their native Kenya, and decided to start planting tomatoes in the midst of Kenya's tea country. Watch part of their story in the video here (courtesy of Land O'Lakes International Development and Land O’Lakes, Inc), and read the rest in the blog that goes with it. It's worth the read. 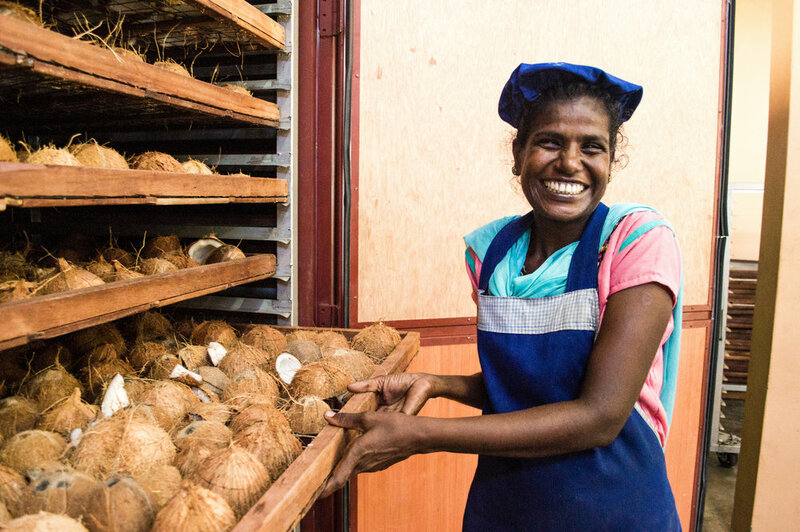 Learn how the coconut is giving a Sri Lankan community hope in the midst of post-war recovery. Read Kanni Mankaytkarasy's story.